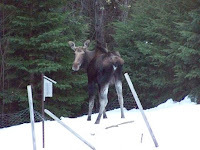 Adirondack Lifestyle ™: Cascade Cow Moose Loves our Neighborhood! The famous Cascade Moose of Cascade Road in Lake Placid were at it again. Today's photo features the Mrs. who was at Art Jubin's Cascade Ski Shop and Touring Center most of the weekend. As a shopping expert, I can attest it is a pretty cool shopping experience to have a wildlife viewing window full of moose while trying on ski boots. Be careful driving on Route 73 just outside of Lake Placid. Although, I have it on good authority that the New York State Department of Transportation (NYSDOT) is finally considering putting up moose crossing signs.